Once a month, kids, along with their parents, are invited to this festive (and FREE!) interactive workshop at JCPenney stores from 11 am to 12 pm. Kids receive a collectible pin for every project they finish. And after each event, adults will receive a special 10% off coupon to use in-store on the day of the event. This coupon can be used in addition to current marketing promotions for maximum savings. It’s a win-win! 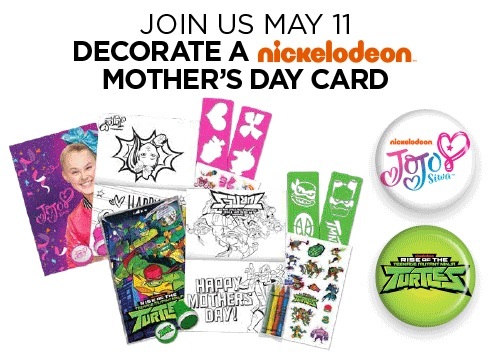 Join JCPenney on Saturday, May 11th for a Decorate a Nickelodeon Mother’s Day Card!